Eden Hazard praised Youri Tielemans for his goal in Belgium's 3-1 win over Russia and expects the Leicester City midfielder to become a "major player". The 21-year-old broke the deadlock in the 14th minute of Belgium's Euro 2020 qualifier on Thursday before a Thibaut Courtois howler gifted Russia an equaliser. Two goals from Hazard, including one from the penalty spot, settled the Group I contest, though, Russia finishing it with 10 men as Aleksandr Golovin was sent off late on. Hazard may have proved the match-winner, but he directed plaudits towards Tielemans whose effort marked his first for the Red Devils. "I am enjoying this victory in which I scored two goals," Hazard said. "It went well. After our last match, the one against Switzerland [a 5-2 Nations League defeat], we had to answer our critics. "We were not always as good today, but we have created opportunities and done our job. "Compliments to him [Tielemans]. He will become a major player." 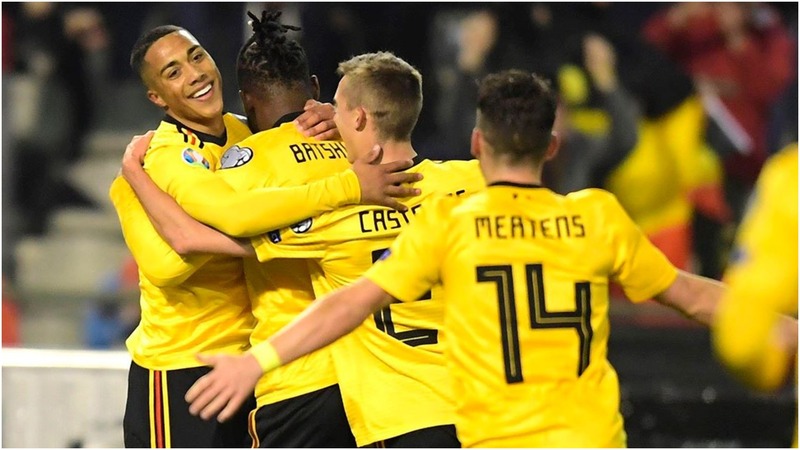 Tielemans added: "I am very happy with that goal. Lots of pride. I am happy with the victory. It was a difficult game, but we did well. "With our qualities, we must and want to win every game. For that we have to play full of concentration and we have done that."